Hi lovelies! Sorry for the long gap between posts again, it's been a crazy few days! My poor little Chihuahua, Belle, got spayed on Friday, but has now got a little infection, nothing serious but enough to make her feel very sorry for herself. Hopefully a course of antibiotics and lots of cuddles will get her back to her cheeky self very soon! On top of that, the salon has been very busy, which is absolutely fab but very time consuming, so anything that isn't work or puppy has unfortunately taken a bit of a backseat! However, with the pup on the mend and getting to grips with my time management, I'm hoping to get back into regular blogging as I really miss it! Today, I thought I'd come back with a beauty wishlist, as there are so many things that I have my eye on lately. I really want to try the new Marc Jacobs Daisy Sorbet perfume as I've read so many rave reviews. The original Daisy/ Eau So Fresh aren't my cup of tea, but I loved the adaptations such as Daisy Sunshine and Delight, so I'm sure I'd love this - definitely let me know if you've tried this as I'd love to know! Another thing I've seen a few blog posts on is this Bobbi Brown Hot Nudes palette, I don't think I've ever tried anything Bobbi Brown before, so I'd love to give this a go. I love the look of all the shades and think it'd make a fab everyday palette. I'm definitely going to pick up the Benefit Roller Lash Mascara, I was sent a sample of this from Benefit and I am absolutely in love with it. In fact, you can guarantee this will come home with me after I finish work (and have a sneaky midday trip to Boots) tomorrow. I usually use my GHDs to curl my hair, but for ages now I've wanted a proper curling wand. This one is fairly cheap but the reviews look pretty good and it comes with three attachments to do different types of curls which I think looks really cool. My boyfriend turned to the laptop when I was looking at this and looked slightly horrified as it does look slightly like an 'adult toy'!! Dodgy shape aside, this does look really interesting and I'd definitely love to give it a go! Finally, I've heard so much about Lip Voltage and while some reviews say it's painful, the fab before and afters of lovely full looking lips are definitely tempting me! I desperately want to get my lips done as I'd love very slightly fuller lips, but I'd prefer a more temporary solution first to give me an idea of how they'd look. Let me know if you've tried Lip Voltage as I'd love to her your thoughts. Thanks so much for reading! Let me know your thoughts on any of the products I've mentioned! i must try out the new Marc Jacobs fragrance! 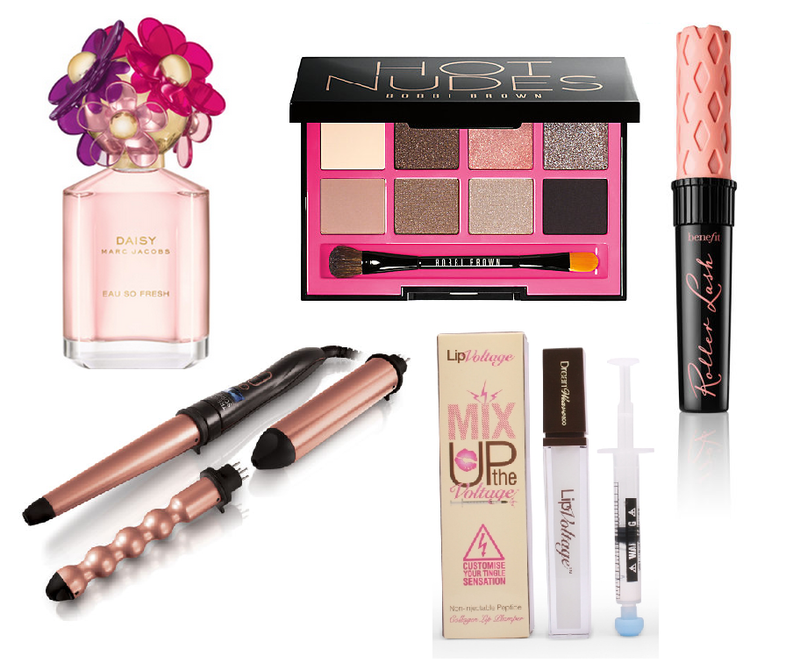 Great wishlist :) I love the look of that curling wand!